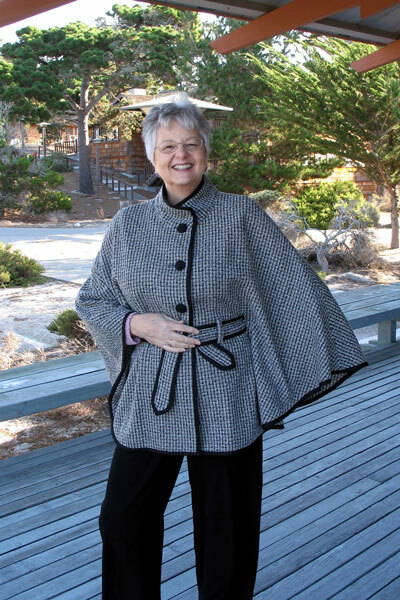 Jane created The London Cape pattern, and it is flattering to all body sizes and types. After trying on Jane's cape, all of Jane's sewing students wanted to make one too. So Jane offered several one day sewing classes, and students left the class with their capes almost completed. A real sense of accomplishment. 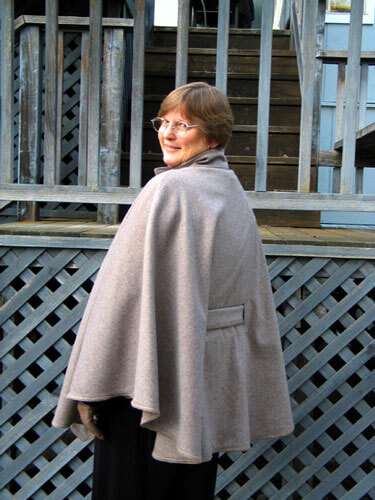 Talk to Jane if you would like to make her London Cape pattern. Jane used a wood for this cape and a black trim on all the edges. Very attractive. The one size fits all pattern was wonderful. A few students adjusted the length, and Jane helped with placement of buttons and belt loops. About 5 yards of trim was needed. 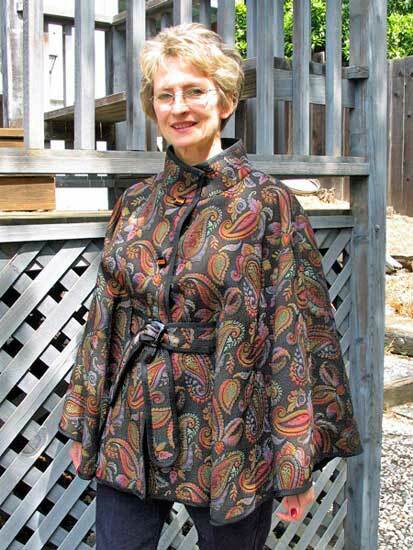 Cheryl got this great fabric from Caledonia Fine Fabrics of Boise, Idaho. 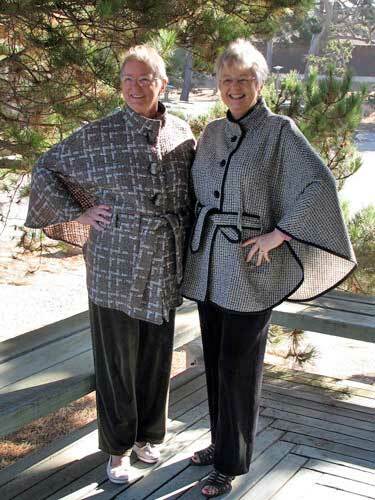 Last year they brought a motor home full of wonderful fabrics to Jane's studio. Cheryl has been taking sewing classes and workshops from Jane for many years. 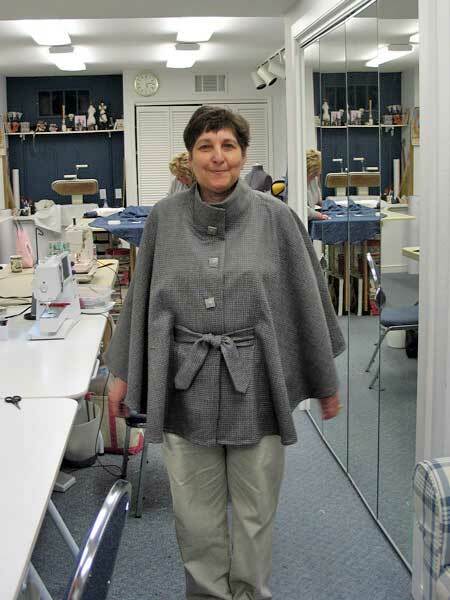 Fran is the star student in one of the cape sewing workshop classes. She completely finished her cape in Jane's one day class. And it looks fabulous on her! The shape and color of her buttons adds a lot of interest. 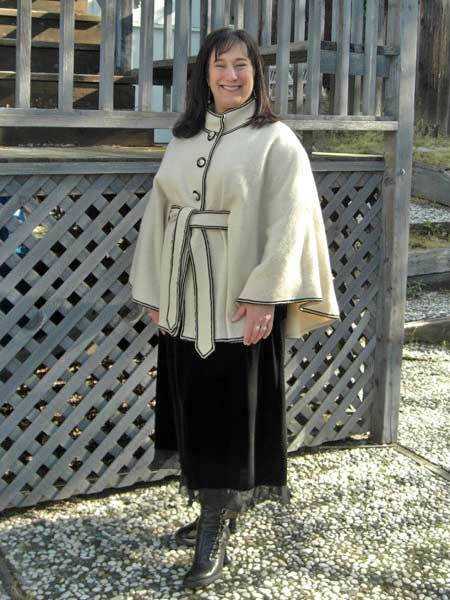 Joy made this cashmere cape and added the trim by hand. The gorgeous buttons came from Britex. 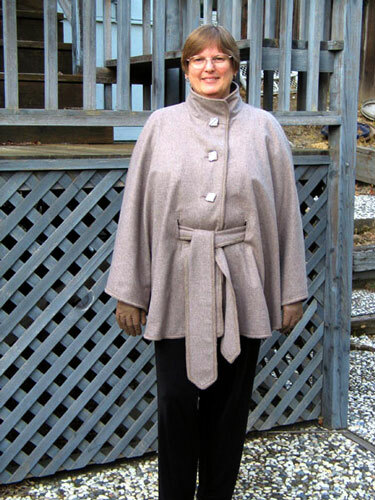 Joy is very proud of her achievement, as this is only the second garment she has constructed in Jane's sewing classes. It looks great on her! Betty just finished hand stitching the binding on this beautiful teal cape. She was happy she took the sewing workshop with Jane. Diana designed a very cool cape. She has worn it several times and has had great feedback. She bought the fabric for a song at an A.S.G. fabric swap, but made up for it with wool trim and buttons from Britex. She can't wait to make another! Her cape looks as stunning from the back as it does from the front. Katherine looks great in her new cape. Her selection of buttons was just perfect! 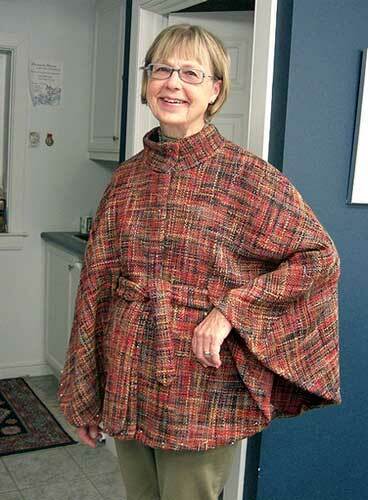 Katherine made this cape for her mom while they were both on a Sewing Retreat and Vacation with Jane. 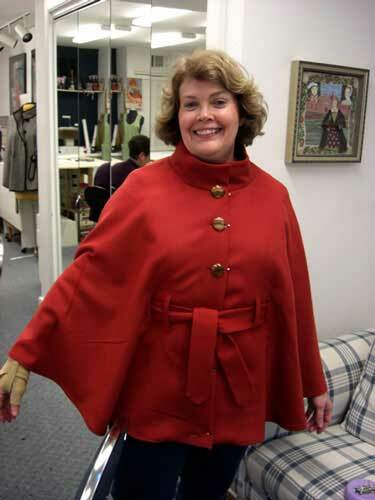 Kathleen will surely have fun in this red cape. She attended the sewing class for making this cape, and almost has it completed. Barbara found the perfect color fabric for her hair, eyes, and skin tones. She looks fabulous and is pleased with having gained individual color knowledge from Jane. 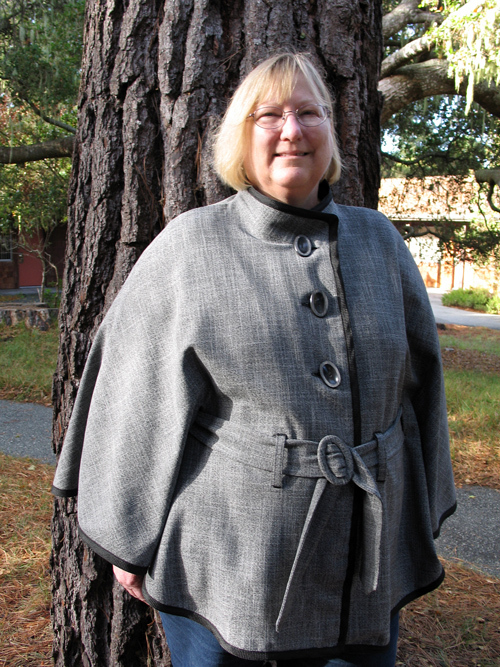 Thea was happy to finish her cape while on the Sewing Retreat and Vacation in Monterey Bay with Jane. She looks great! 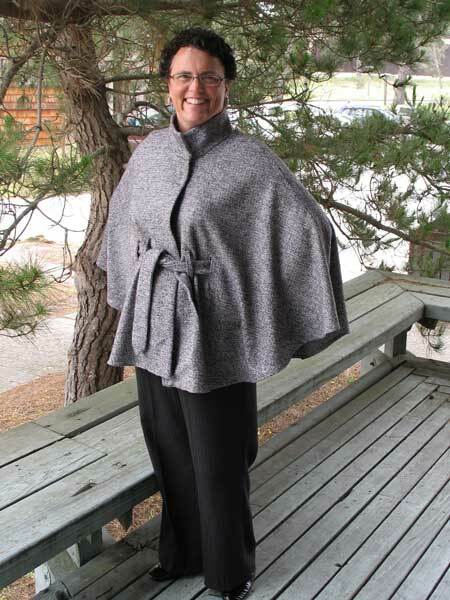 JoAnn finished her cape on the Sewing Retreat and Vacation in the fall of 2012. She had Pat Mahoney of Lodi, CA cover her buckle. 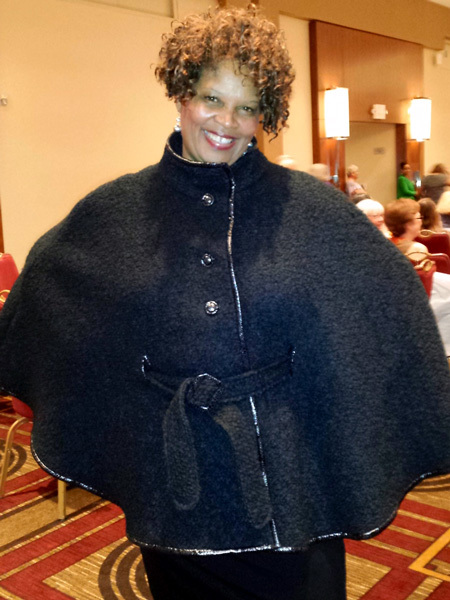 Susie wore her cape, made from Jane's London Cape pattern, in the American Sewing Guild Fashion Show at their summer 2013 conference in Washington DC. 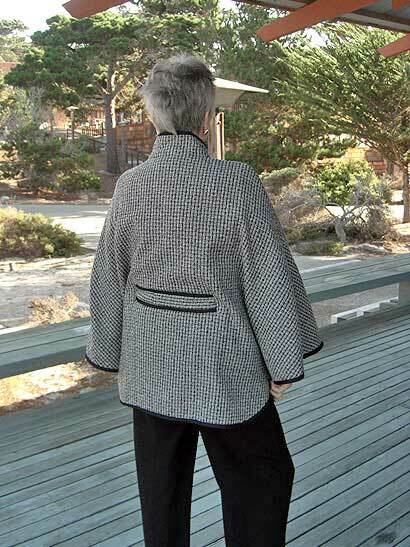 Susie was working on her cape at the Asilomar Fall 2012 Sewing Retreat with Jane, and it is now completed. 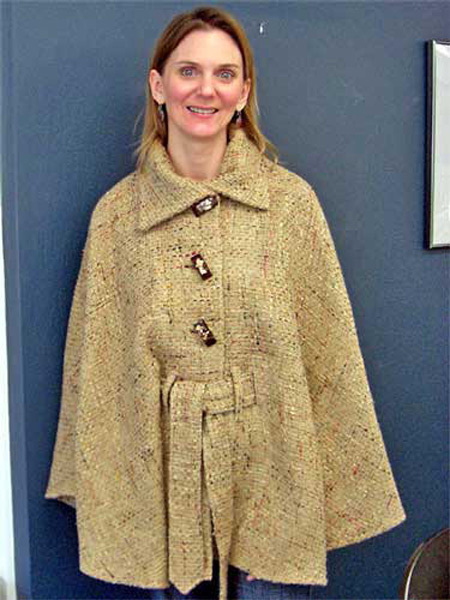 She used Jane's London Cape pattern. 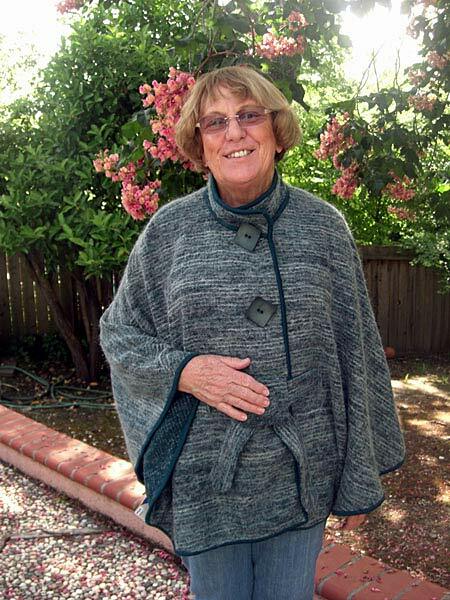 The buckle and buttons were covered by Pat Mahoney of Lodi, CA.